I am so excited about the giveaway, and I am super excited that I get to introduce you to one of my very favorite of very favorite authors. Miss Amy Dashwood of Yet Another Period Drama and The Quest for Stories two absolutely delightful blogs that I suggest you go and follow at once! Make haste, make haste! 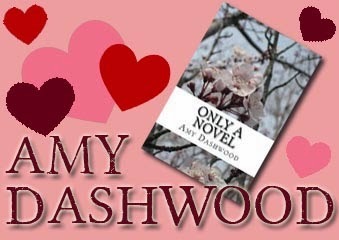 For there you will find Miss Amy Dashwood's brilliance, wit, wisdom and dear stories. For this giveaways she is offering her novel and one of my favorite stories that I have read over and over and over again. Only A Novel. It's truly a little wonder of delight, wit and humor that will warm your heart and tickle your funny bone until everyone (your family and even you coworkers in the lunchroom) will beg you to read aloud. It has the sweetest touch of romance, realistic growing up and such a cast of lovable characters. (There is one character who I almost squeal when their name appears on the page. Their initials are R.B. shh, don't let any of my characters know!) This is one of my go to books when it comes to giving a good book to a friend. I read a quote somewhere once that said, “I do not love writing; I love having written.” I don’t remember who wrote that, but it definitely struck a chord with me-- I love rereading something and thinking, “this is good, I feel accomplished, this came out the way I wanted it to,” but I don’t really like the struggle of getting the words onto paper and making them flow the way they do in my head. The accomplished feeling that accompanies getting it right is a rare thing, indeed, but when it does come it’s like that famous ninth cloud. Who is your favorite book couple ever? Oh, dear, you would ask this. I find it very hard to choose favorites in general, and when it comes to favorite fictional characters it’s just as bad as trying to pick a favorite family member. Maybe Emma and Mr. Knightley from Emma? They’re just so perfect together. They understand and put up with each other’s quirks and failings, they have the same sense of humor, they feel comfortable and safe with each other... it’s basically the ideal relationship. What is your favorite “first meeting” between a story couple? Well, all right, I suppose I’ll go with Anne and Gilbert in Anne of Green Gables. That’s probably the most hilarious first meeting of all time-- the slate incident, that is. And it totally counts as the first meeting because in the book it happened on the same day that they met, so it’s still legitimate. Second place might go to Elizabeth Bennet and Mr. Darcy, if only for the “tolerable, but not handsome enough to please me” line. Heehee. What couple did you ship, only to be disappointed? Enjolras and Eponine in Les Miserables. THEY NEED TO BE TOGETHER. What couple ended up together, but you wish they hadn’t? I tend to be a very canonical person, if that’s even a thing... if the book says it, that’s that. Off the top of my head, I’m having a hard time thinking of a couple I wish hadn’t gotten together. As far as protagonist-couples go, that is. People like Lydia Bennet and George Wickham don’t count. What confession/ proposal or wedding touched your heart? Oh, so many. SO MANY. The second proposal/confession of love in Jane Eyre, the entirety of chapter 49 in Emma, practically every time Sir Percy and Marguerite get soppy with each other, heehee, Jo and Professor Bhaer’s discussion under the umbrella, that scene at the very end of Rilla of Ingleside when Ken comes back... yeah, I could be here all day. On a different kind of love, what is your favorite bro-mance or sisterhood in a novel? I’ve always loved the friendship between Cordy and Chrys in Carol Ryrie Brink’s Two Are Better Than One... a darling book that’s often overlooked where classic children’s literature is concerned. What book really illustrates the love of God for us in a way that caught your attention? (I assume we’re taking the Bible as the obvious answer here, and talking about other books in addition to that?) The first book that did that for me was probably The Hiding Place by Corrie ten Boom, which is just about the best book ever for showing how He cares for us and leads us through trials without ever abandoning us. Stepping Heavenward by Elizabeth Prentiss is also a great reminder of how patient God is with His wayward children! What is your favorite form of love to write into your own books? I’ve written a few romantic bits in my own stories but my favorite kind of relationship to write is that between siblings... I have a three amazing sisters and one fabulous brother with whom I’m really close, and I feel there’s a tremendous dearth of books these days that portray healthy, loving sibling relationships. Someday I want to write a book about a really close friendship between two girls (I happen to have the best friend in the whole world, so I have lots of source material), which hasn’t come about yet since I’m still working on other projects, but it’s definitely a subject close to my heart. Do you have a favorite couple of those you’ve written? Why? Was there ever a couple in your stories that you were not planning on ending up together but finally ended up writing in? Ditto to the above question. Heehee. I never intended to have a love interest in Only a Novel, but once Rodney popt up and made his presence known, I started to think maybe he and Elizabeth ought to be a Thing. Do you find it harder or easier to write romantic love or friendship love in your books? Definitely friendship love-- I’ve enjoyed that in large doses throughout my life, whereas I have yet to fall in love in a romantic way. And though I strongly advocate that you do not need to have lived through something in order to write about it (otherwise there would be no such thing as fiction) it’s definitely easier to write from experience. Do you have a favorite friend pair in your books? Sylvia Lemmins and Celia Rochester in my unfinished novel How It Began With the Rocehsters, I do believe. Favorite love story you’ve written? Rodney and Elizabeth’s in Only a Novel is the only one so far, so by default it wins! This may seem like taking the lazy way out, but really I couldn't possibly express it better than Paul did in 1 Corinthians 13-- love is patient, love is kind, it does not envy, it does not boast, it is not proud... it always trusts, always hopes, always believes and never fails. Thanks so much for inviting me to this interview, Jessica and Elizabeth! 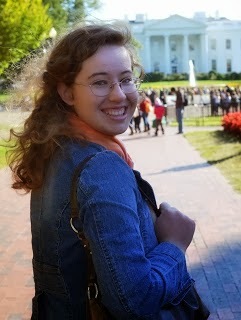 Miss Amy Dashwood is a daughter of the King of Kings, a scribbler, a Janeite, a homeschool graduate and a bookworm. She began writing at age seven, as a preventative measure so she'd never run out of books to read. Stories are her passion, but she also finds time to dabble in other interests (musical theatre, historical costuming, and tea in a teapot, to name a few). She believes in windy walks, long period dramas, pretty clothes and the power of words. You can find her at Yet Another Period Drama Blog or The Quest for Stories. Lovely interview! I quite enjoyed reading it but I shouldn't have been doing so because I'm supposed to be working on blog posts. Again. Lovely! I enjoyed yours! I cannot wait to read Only a Novel. It is high on my to buy list. Anyway, I read the Amazon preview of Only a Novel and it looks great! Valentine Book Lover Link Up!